The rare association of pontocerebellar hypoplasia with anterior horn cell involvement has been classified as pontocerebellar hypoplasia type 1. Its classic phenotype is usually severe. However, the pontocerebellar hypoplasia type 1 may have wider variability in clinical and radiological features. There may be a genetic heterogeneity as well. We described here a young girl with relatively milder clinical phenotype with cerebellar atrophy with absent pontine involvement, further adding to the clinical phenotype. The rare association of pontocerebellar hypoplasia with anterior horn cell involvement has been classified as pontocerebellar hypoplasia type 1. Its genetic basis was largely unknown until recently. ,, The classic phenotype is severe with intra-uterine abnormalities, neonatal feeding and breathing difficulties, contractures, and early death. Milder phenotypes have been rarely reported. ,, We describe a young Indian girl who was diagnosed as pontocerebellar hypoplasia type 1. A 2-year-old girl presented with delayed milestones and floppiness. She was the second child of a non-consanguineous couple with no perinatal or antenatal complications. She had global developmental delay. She achieved head control at 8 months of age but did not achieve independent sitting. She had palmar grasp with transfer of objects. She recognized her parents, responded to her name, and spoke monosyllables. She had no neuroregression. There was no history of seizures, difficulty in feeding or breathing, or recurrent chest infections. There was no vision or hearing impairment. The family history was unremarkable. Examination revealed an undernourished, alert infant. Her head circumference was normal. There were no neurocutaneous features, facial dysmorphism, spinal deformity, or contractures. She had no bulbar dysfunction but had horizontal nystagmus and tongue fasciculations. There was global hypotonia with absent muscle stretch reflexes and poor antigravity movements. There were no ptosis, facial weakness, extra-pyramidal movements, or cerebellar signs. The fundoscopy was normal. The rest of the systemic examination was unremarkable. Her initial investigations revealed normal hemogram, serum electrolytes, liver, renal, and thyroid function tests, and total creatine kinase (50 IU/L). The nerve conduction study was normal. Needle electromyography was performed in the right vastus lateralis and deltoid muscles. It revealed a neurogenic pattern of involvement with normal insertional activity, frequent fibrillations and positive sharp waves, and very few motor unit action potentials (MUAPs), which were large, and polyphasic and reduced recruitment. The child did not show any deletion of exon 7 of the survival-motor-neuron (SMN1) gene. The muscle biopsy from the left vastus lateralis muscle showed variation in fiber size, fiber type grouping, and hypertrophied type 1 fibers suggestive of spinal muscular atrophy. There was no evidence of mitochondrial cytopathy in the biopsied muscle. The isoelectric focusing of transferrins was normal. Magnetic resonance imaging of the brain showed cerebellar atrophy [Figure 1]. A diagnosis of pontocerebellar hypoplasia type 1 was made in view of paralytic hypotonia, cerebellar atrophy on neuroimaging, and clinical, electrophysiological, and pathological evidence of anterior horn cell involvement. Genetic testing could not be done. The nutritional and physical rehabilitation was initiated, and genetic counseling was done. The clinico-radiological differentials of pontocerebellar hypoplasia include congenital disorders of glycosylation (CDG), mitochondrial disorders, progressive cerebello-cerebral atrophy, infantile cerebral and cerebellar atrophy, phosphoserine aminotransferase deficiency, and the progressive cerebellar atrophy-encephalopathy-hypsarrhythmia-edema-optic atrophy syndrome (PEHO syndrome). Associated cortical dysplasia may point towards lissencephaly syndromes and dystroglycanopathies. A meticulous evaluation may help in ruling out these entities. Thus, pontocerebellar hypoplasias type 1 may have wider variability in clinical and radiological features. There may be a genetic heterogeneity as well, and further genetic discoveries may help in better understanding of the pathological process involving the cerebellum, brainstem, and spinal cord. We described here a young girl with relatively milder clinical phenotype with cerebellar atrophy with absent pontine involvement, further expanding the spectrum of this disorder. 1. Barth PG. Pontocerebellar hypoplasias. An overview of a group of inherited neurodegenerative disorders with fetal onset. Brain Dev 1993;15:411-22. 2. Renbaum P, Kellerman E, Jaron R, Geiger D, Segel R, Lee M, et al. Spinal muscular atrophy with pontocerebellar hypoplasia is caused by a mutation in the VRK1 gene. Am J Hum Genet 2009;85:281-9. 3. Simonati A, Cassandrini D, Bazan D, Santorelli FM. TSEN54 mutation in a child with pontocerebellar hypoplasia type 1. Acta Neuropathol 2011;121:671-3. 4. Rudnik-Schöneborn S, Senderek J, Jen JC, Houge G, Seeman P, Puchmajerová A, et al. Pontocerebellar hypoplasia type 1: Clinical spectrum and relevance of EXOSC3 mutations. Neurology 2013;80:438-46. 5. Rudnik-Schöneborn S, Sztriha L, Aithala GR, Houge G, Laegreid LM, Seeger J, et al. Extended phenotype of pontocerebellar hypoplasia with infantile spinal muscular atrophy. Am J Med Genet A 2003;117A: 10-7. 6. Lev D, Michelson-Kerman M, Vinkler C, Blumkin L, Shalev SA, Lerman-Sagie T. Infantile onset progressive cerebellar atrophy and anterior horn cell degeneration: A late onset variant of PCH-1? Eur J Paediatr Neurol 2008;12:97-101. 7. Kalpana D, Parvathy L, Ahamed SM, Iype M, Kunju MP. 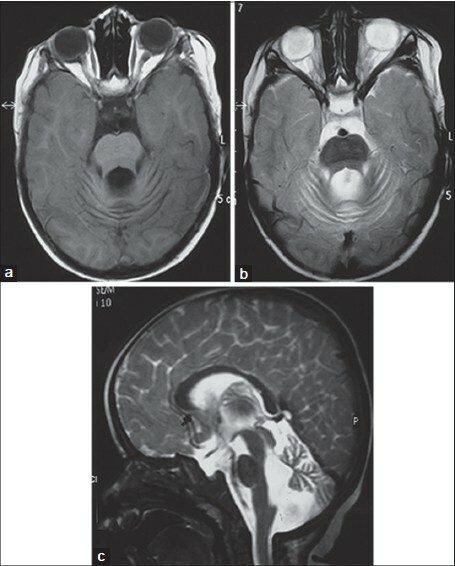 A mild variant of pontocerebellar hypoplasia type 1 in a 12-year-old Indian boy. Pediatr Neurol 2009;40:302-5. 8. Parisi MA, Dobyns WB. Human malformations of the midbrain and hindbrain: Review and proposed classification scheme. Mol Genet Metab 2003;80:36-53. 9. Namavar Y, Barth PG, Poll-The BT, Baas F. Classification, diagnosis and potential mechanisms in pontocerebellar hypoplasia. Orphanet J Rare Dis 2011;6:50. 10. Anderson C, Davies JH, Lamont L, Foulds N. Early pontocerebellar hypoplasia with vanishing testes: A new syndrome? Am J Med Genet A 2011;155A: 667-72. 11. Norman RM. Cerebellar hypoplasia in Werdnig-Hoffmann disease. Arch Dis Child 1961;36:96-101. 12. Wilmshurst JM, Surtees R, Cox T, Robinson RO. Cerebellar ataxia, anterior horn cell disease, learning difficulties, and dystonia: A new syndrome. Dev Med Child Neurol 2011;42:775-9. 13. Sztriha L, Johansen JG. Spectrum of malformations of the hindbrain (cerebellum, pons, and medulla) in a cohort of children with high rate of parental consanguinity. Am J Med Genet A 2005;135:134-41.